Back to school time! I know that most people are starting their back to school shopping now. It seems like every year the lists get longer and longer. 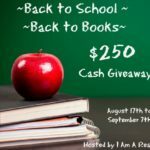 Because of that, I have decided to partner with some wonderful authors and bloggers in order to help out one of you with your back to school shopping! 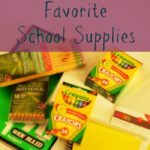 Even though we started school a couple weeks ago, I am still on a mission to find some great deals for clothes, school supplies, and most importantly (in my opinion! ), more books. With the number of items that are always on our “to buy” list, a little extra cash is always helpful. We have also decided this year to purchase some extra school supplies to donate to our local elementary school. I know that so many teachers put so much of their own money into supplies for the children they teach every day. I think anyway we, as a community, can give a little extra, it is appreciated. Without further ado, here is the giveaway for this month! 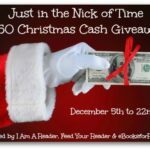 I hope that one of my readers wins! Please make sure you come back and let me know if you do win. What would you use the prize for?